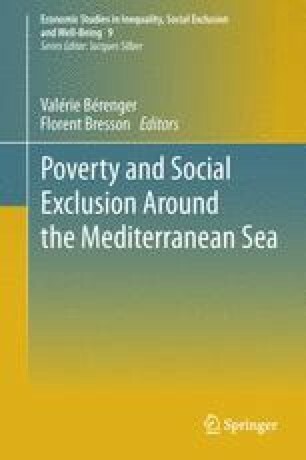 This chapter provides a step-by-step account of how fuzzy measures of both non-monetary deprivation and monetary poverty can be constructed using survey data such as that from the EU-SILC (European Union-Statistics on Income and Living Conditions). In the case of non-monetary deprivation, meaning dimensions or groupings of initial items of deprivation are identified using explanatory and confirmatory factor analyses, and a weighting system is applied to ensure the aggregation of individual items into the dimension they represent. An application of the proposed methodology is conducted using EU-SILC 2007 data from Turkey: estimates are provided at national level and also disaggregated at regional (NUTS1) level. This paper has been partly funded by the Italian PRIN research project n. 2007 HEWTBE-003, and partially funded by the European Commission 7th Framework Project FP7-SSH-2007-1 n. 217565–SAMPLE. The authors are grateful to Dr. Enver Tasti, Dr. Francesca Gagliardi, Dr. Giulio Tarditi and Dr. Janet Donovan for their support and helpful comments. HS110: Do you have a car? HS090: Do you have a computer? HS070: Do you have a telephone (including mobile phone)? HS100: Do you have a washing machine? HS080: Do you have a colour TV? The indicator relating to the worklessness of the household is constructed in the following way. Firstly, we exclude households consisting only of persons who are aged 18–24 in full-time education or who are older than a country-specific retirement age. In order to choose an appropriate retirement age, we have proceeded as follows: among the people who have worked, we consider the distribution of the ones who are retired (PL030 = 5) by age and gender. By examining the ratio of people from a particular age group who are retired, we look for the specific age at which a large jump in this proportion is found to occur. Once this point has been found, we confirm it by examining its relationship to the legal age of retirement for a specific country. Among the remaining households, we classify the people as employed or not employed using variable PL030. We, thus identify the degree of worklessness of a household by constructing a ratio where the numerator contains all the people in the household for which the variable PL030 takes a value of 1, 2 or 7, and the denominator is the sum of the people of the household for which PL030 takes a value of 1, 2, 3, 6, 7, 9, and values of 5 and 8 only if the age of the person is less than the retirement age as chosen above. So at household level we construct an index reflecting the degree to which eligible household members are engaged in work: a zero indicates a workless household with some of its members at working age; a one indicates that all the working age members are working. The variable for general health, PH010, is aggregated as follows: to the categories 1–2–3 is assigned the value 1 and to categories 4–5 the value 0. Next, this variable is aggregated at household level, so that a household is considered deprived for that indicator if at least one person in the household is deprived for the item. So the score s assumes the value 1 if no one in the household is deprived in relation to that item, and it assumes the value 0 if at least one person is deprived. The same kind of household aggregation is carried out for all the personal variables relating to health and educational status.